TEA STREET Blog: Don't read this unless you're Posh! Don't read this unless you're Posh! If you've been around a while, you'll know I have a love/hate relationship with Mr Earl Grey! Until a year or so back, it was just a hate relationship, but maybe like some of you I just hadn't found the right one. Nowadays though, i'm much better informed and realise that full-leaf tea is a whole other world, which I get to share with you on this blog. 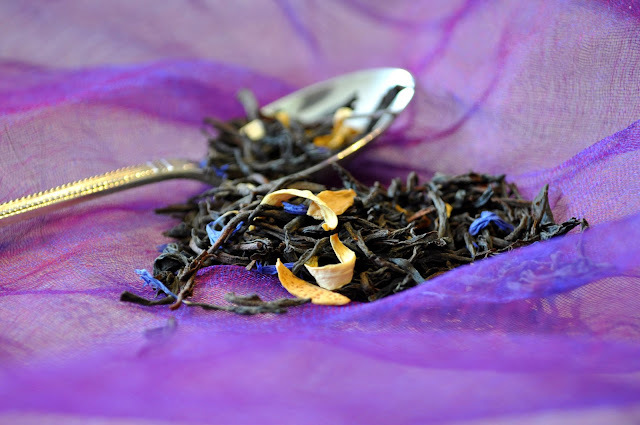 Since it's finally summer (as much as Britain can be) I felt it was a perfect time of year to reach for Lu Lin's 'Posh Earl Grey' loose-leaf tea, that i'd saved for myself. Well posh suits me just fine, so I was happy to see what it was made of! As I always say, it's not an ego if you can back it up! On opening the packet your nose is infused with Bergamot and you can't help but notice how generous this tea blend is with its ingredients. This is nice to see as some brands can be a little frugal with the special touches. Look at the big orange flowers and little blue cornflowers nestled amongst the whole leaves of Ceylon and Lu Lin's Single Estate Keemun teas. Arrrrrh, gorgeous rich tea aroma that excites the senses while making you feel as though you're wrapped in a blanket watching a sunset. Where have you been all my life!! I loved how much the tea leaves and the orange flowers opened up into swirls making up this rich amber-coloured brew. I found it medium bodied from the ceylon flavour coming through, yet complex with high notes that could have come from the Keemun leaves. I had this straight up and couldn't imagine ruining it with milk. Why bother when it has a soft texture with no bitterness? There's some orchid flavours and a little tang from the orange and bergamot, which makes it so suited to summer. I'd say this is as refreshing as it gets if you like drinking hot tea on a warm day. It would taste lovely with a nice light sponge cake, or a posh afternoon tea if you were going all out. But don't be put off by thinking this is a tea for girls - men can be posh too! With its lasting aftertaste that leaves you feeling nourished and comfortable, this Posh Earl Grey make you feel perfectly centred and happy to take a well-deserved break. Where's the teapot..?! This tea will cost you £7.50 for 100g, which is about £0.08 per cup. Lu Lin teas are a UK based company that imports ethically sourced tea from China. Lu Lin means 'green forest' in Chinese, which they say reflects the natural and healthy aspects of their products.